The first time I saw the original Tarzan, I didn’t like it very much but since it had been a very long time since my viewing of Tarzan, I decided to watch it before watching Tarzan II. On a Second viewing, I didn’t hate it as much as the first time. As it turns out Tarzan II is a midquel so there might have been more drama and tension if I hadn’t seen the original. 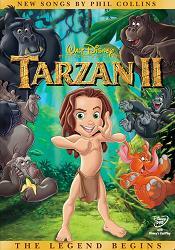 Tarzan II takes place when Tarzan is a young wee bit of a thing, trying his hardest to be the best ape he can. 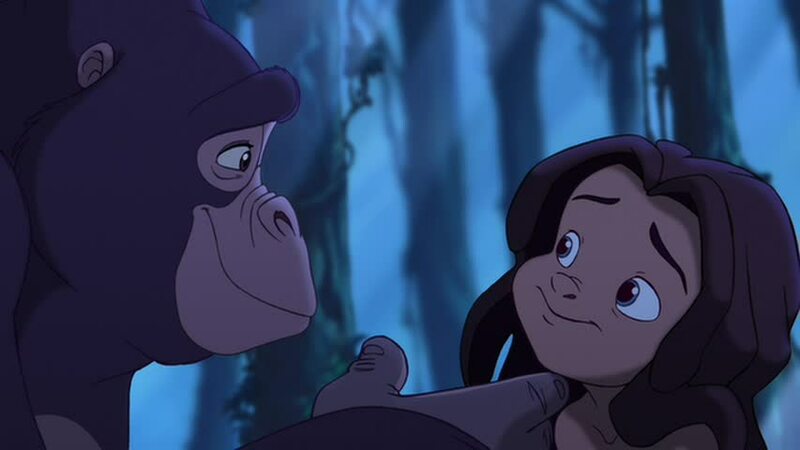 Tarzan feels he and the family would be better off is his wasn’t there but his ape momma, Kala, assures him that family is awesome at the 8 minute mark. Tarzan, however, gets separated from his family and decides to run way when he overhears some gorillas saying that they will be better off without him. He runs into a family of bitter Gorillas who live in a rocky rift and can’t leave because of a monster called the Zugor. The Zugor turns out to be an old Gorilla named Zugor who is scaring animals so they will leave him alone. Tarzan bargains with him to teach him stuff in return for keeping his secret. Tarzan wants to know what he is and what his talents are. It’s at this point he starts horning his human brian which impresses Zugor. 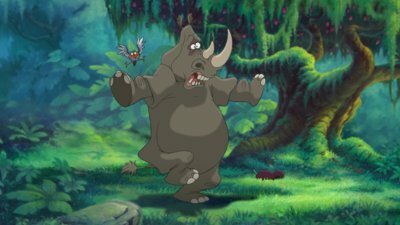 Terk and Tantor go to look for Tarzan after Tantor hears Tarzan yelling. 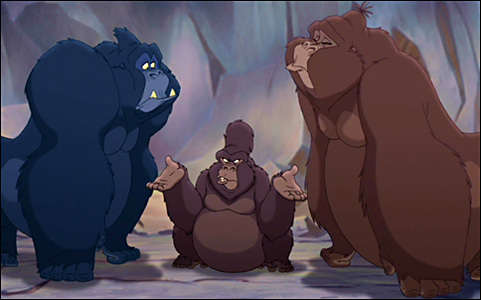 Terk and Tantor run into the bitter Gorilla family. 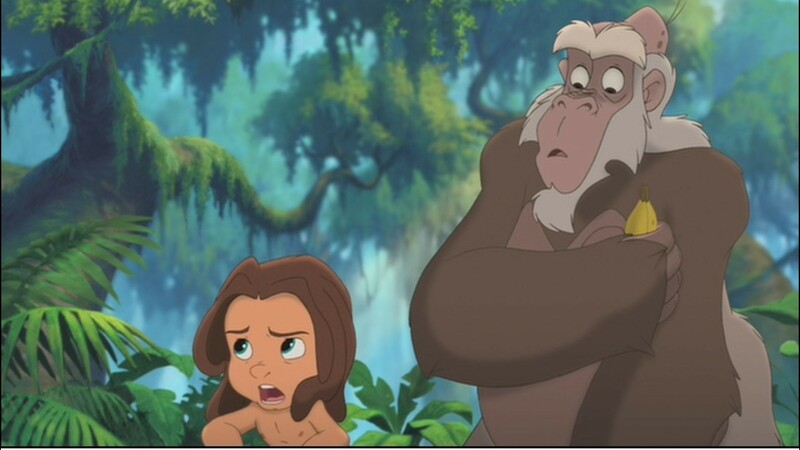 To save them, Tarzan spills the beans about Zugor and Kala and three baby Gorillas get in the fray. Tarzan uses a vine to swing and to save Kala and the babies and Zugor find his place with the formerly bitter Gorilla family. 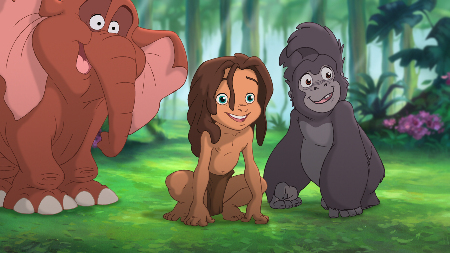 Tarzan learns that no matter what he is, he a part of a family. 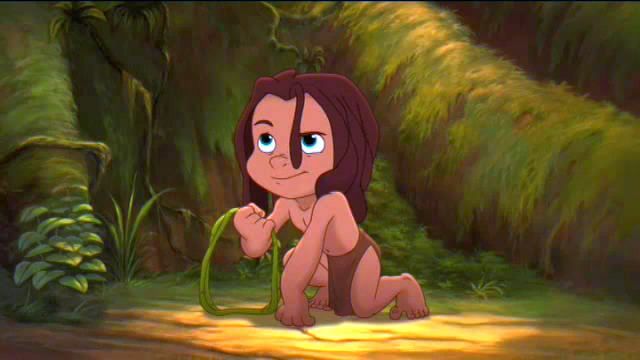 It’s pretty obvious that Tarzan II takes place during that growing up montage. As far as midquels go, Tarzan makes sense to have one, unlike Beauty and the Beast but just because it made a little sense to shoehorn another story in the original, midquels are stupid. 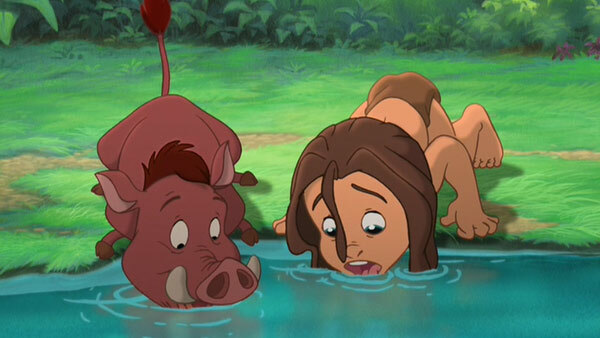 Because we have seen Tarzan we know that nothing bad can happen in this story. We also know that all the character development in the midquel happen in like 4 minutes in the original. Midquels are therefore boring and dull to watch and by their very nature they can’t add anything to the original story. Lion King 1 1/2 could have made the sequel make a little sense by showing the Scar loyalist leaving Pride Rock but on a whole Midquel can’t have any tension or drama. As it is Tarzan II despite not having any sense of drama or original character development is not wholly bad. The fact that it is a midquel does make it boring but for hour story it’s fairly not that bad but it has some issues. First annoying little issue, and this was an issue I had in the first movie, if the gorillas and Tarzan can talk to Tantor why can’t they talk to the other animals? This is just annoying and I don’t get it. Second annoying issue, where the hell is this? I mean I know it’s in the Jungles of somewhere in Africa but where? Africa is a big continent so where is the place with Elephants, Gorillas, Rhinoceros, Hippos, Warthogs, Leopards (or one) and if I count the first movie Lemurs, Baboons and Taisers. Lemurs only live in Madagascar but none of the other animals do so I gotta say F U Disney. What is Disney’s issue with pan-menagerie of animals especially when they had a dumb throw away line about piranhas being native to South America? I could tone out this issue in the original movie but in the midquel it was annoying. Then we have the new characters, Zugor, Uto, Kago, and Mama Gunda. At least the have contrived yet distinct personalities, Zugor is a lovable grump, Uto is dense, Kago is violent and Mama Gunda is overbearing. Uto, Kago and Gunda are considered the antagonist but they are weak ones and they hardly count. However as weak as they are, they are miles more entertaining than Ursula’s crazy sister or the Tim Curry organ. It says something if before the ten minute mark the viewer knows the core lesson, Family is awesome. To be fair most of these sequels is about family or friends being awesome. On some occasion it’s love that is awesome but that is rarer. Tarzan II is so blatant with its message that I felt I could have turned it off after 8 minutes. It did make for a nice little bookend with beginning and the end but you know Tarzan is still with his family because of the original so having it blatant in the narrative indicates that the movie thinks its audience is stupid. Then again these sequels are used as babysitting tool to get kids sleep, so touche movie. Tarzan II as a whole thing isn’t that bad but it being a midquel is offer very little. If you need to kill an hour or have to entertain a child there is worse stuff to watch.